I return to this journal page after my semi-introduction musing holding in my fingertips some November News. I should be facing the interface of OpenOffice Writer, adding words to my NaNoWriMo word count in a desperate attempt to reach 50,000 on or before November 30 midnight. But then some news just can’t wait to be bragged blogged about. The kind of news that 140 characters of Twitter won’t be able to brag blog. So here I am, in the full 150MB glory of my web space, bragging blogging about some November News. (Note to self: Remind me that I do not Twitter and that I haven’t any plans of doing so yet). Ah word counts. After a week, it seems that my NaNoWriMo for this year will be a good deal better than my NaNoWriMo last year–let’s hope I get over this awkward transition scene I am writing and that this NaNoWriMo goodness continues. I have a story inside my head and when a story is trapped inside your head, the bestest thing to do is to write it down till it shuts up, or else the idea might get jealous at your neglect and go to goodness-knows-where. I am grateful to this idea for not running away and reminding me of itself in my time of greatest need. After all, I’ve held it inside my head for almost a year now. This idea presented itself to me while I am in a math class. I don’t know why, of all places, did it appear to me in a math class. I guess that just goes to testify that boring lectures really do hound me left and right. (Note to self: I didn’t find Math53 boring at all. Of all my maths it is the one I enjoyed best so far). It isn’t news that I am such a Sandman fan. That little tribute I have (reinstated) in my homepage isn’t new; I once had it adorning the headers of a dream journal. Needless to say, Sandman is too costly a leisure for my limited finances. And UP students aren’t really known for being rich. I entered UP with only three copies of Neil Gaiman’s acclaimed work. My Sandman Library, before I entered UP. (L-R) Dream Country, Season of Mists, A Game of You. Back in high school, aside from not having enough finances for my Sandman Library, there is also the matter of Sandman proximity: no nearby bookshop that I know of sold Sandman stuff. And now, in college, aside from bragging rights, my University affords me access to one-jeepney-away malls with bookshops selling Sandman books. Lucky me. As my freshman year ended, my Sandman Library doubled in size. My Sandman Library, post First Year. (L-R) Row I: Dream Country, Season of Mists, A Game of You. Row II: The Dream Hunters, Preludes and Nocturnes, The Sandman King of Dreams. Dream Hunters, that golden book at the lower-left corner, is a spin-off volume penned by Neil Gaiman in celebration of a Sandman anniversary. This book, unlike the “canonical” ten-volume series, isn’t a comic book; it is a novel, richly clad with illustrations from Yoshitaka Amano, of Final Fantasy fame. The black one at the lower-right corner, differs with the rest of the books in this picture as it isn’t really a brainchild of Gaiman. It isn’t even a story. The Sandman King of Dreams is a book by Alisa Kwitney, third assistant editor of the Sandman series, which is more or less like a guide/behind the scenes to the ten-volume epic. And then there is the matter of a little-known story regarding my summer class adventure. I’ve talked about my first encounter with Physics hell but not about this one. Not that I haven’t talked about it at all; I tell the people I encounter about my fantastic discovery and, in the process, realize how too few people know how expensive books can get. In UP, it isn’t surprising to encounter book stands at any time of the year, at any corner of the campus. Most of these book stands sell books you won’t find in bookstores: from books censored due to extreme (usually leftist) radicalism to books that bookstores don’t sell just because the book concerned is way past its sell-time prime, to books you won’t find in bookstores because they are already too old and dusty for colorful shelves. I am not much a fan of them but every once in a while I find a book I really like on their displays. These book stands come and go, which is really inconvenient should you find a book you’ve been really looking for in their displays but will not have the money for it until next week. You return next week only to find an empty spot in the place where the book stand should’ve been. You despair for the missed chance and maybe curse off the delicious lunch which drained your pockets last week, before you encountered the book of your dreams. And then there is that book stand along AS Walk which I, for the sake of having something to refer to, will baptize as Manong’s Mega Book Stand. I encountered Manong’s Mega Book Stand just last summer. As I am not a very huge fan of book stands I came in just wanting to have good look around, just in case I get that rare Eureka! moment that I find a book there that I can’t find elsewhere. The moment I stepped in, I realized the difference between Manong’s Mega Book Stand and all the other book stands instantly for there, on the shelves of Manong’s Mega Book Stand stood a decent number of books I would really like to have on my personal library. And they are sold in prices way cheaper than their book store counterparts. Books by Arturo Perez-Reverte, especially some of the books in his Capitan Alatriste series. Collections of The Far Side comics. Graphic novels by Neil Gaiman (that is to say, graphic novels of Neverwhere, Stardust, Black Orchid, possibly more that I just can’t remember. 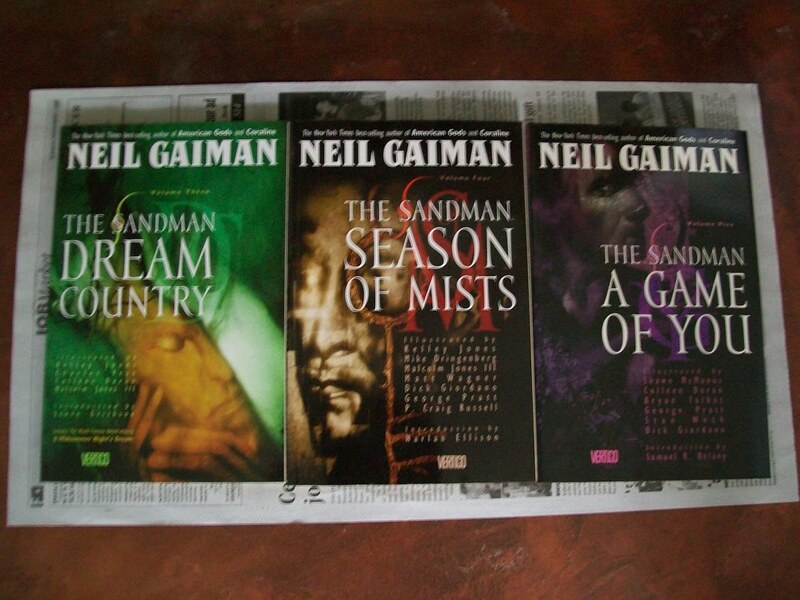 And yes, “Graphic novels by Neil Gaiman” also means thecomplete Sandman series). I do not know if Manong’s Mega Book Stand still has the complete Sandman series. After all, I already have, in my book shelves, a good majority of them. 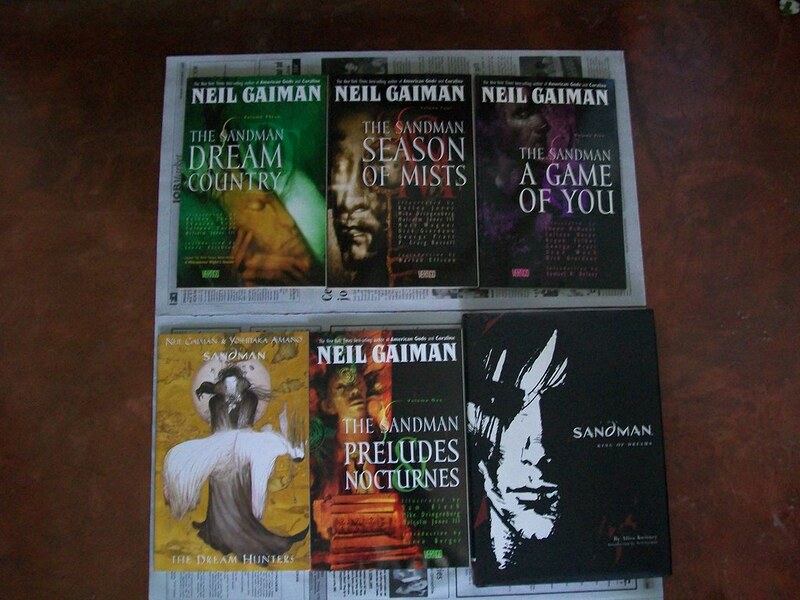 Thanks to Manong’s Mega Book Stand, I have already completed my Sandman Library. My Sandman Library circa November 5, 2009. Arranged in order of acquisition. (L-R) Row I: Dream Country, Season of Mists, A Game of You. Row II: The Dream Hunters, Preludes and Nocturnes, The Sandman King of Dreams. Row III: The Doll’s House, Fables and Reflections, Brief Lives. 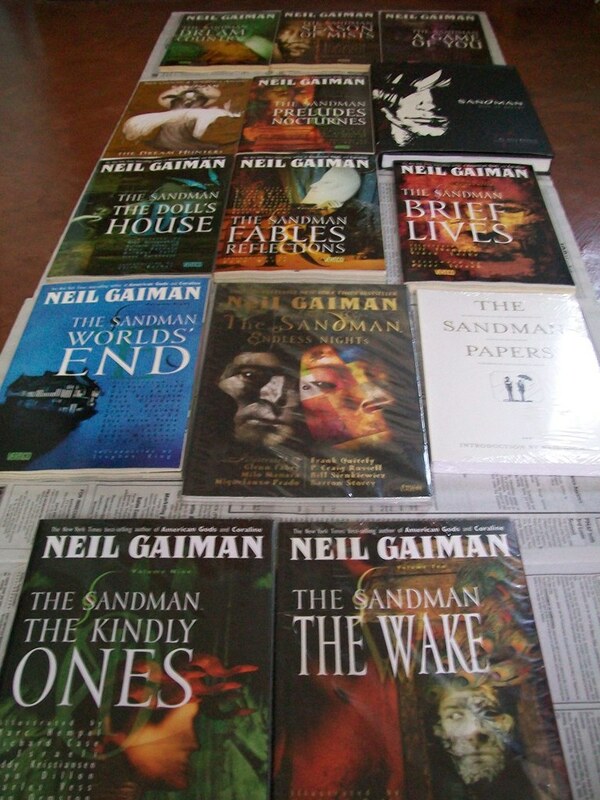 Row IV: World’s End, Endless Nights*, The Sandman Papers* **. Row V: The Kindly Ones*, The Wake*. * Yep, they are still in plastic by the time this picture was taken. As of this writing, I have already opened The Kindly Ones. ** The Sandman Papers didn’t come from Manong’s Mega Book Stand. Turns out that not only did my University give me easy access to malls with bookshops selling Sandman; it also helped me complete my Sandman Library! You would have to congratulate me for this feat. And I would have to thank Manong’s Mega Book Stand so much for this. Well, there, that’s all I have to blog brag about right now. I still have a novel to write. See you this November End.